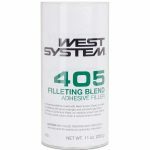 West System 405 Filleting Blend Adhesive Filler - Goosebay Sawmill and Lumber, Inc.
405 Filleting Blend Adhesive Filler is a strong, wood-toned epoxy filler for use in epoxy joints and epoxy fillets on naturally finished wood. It mixes easily with epoxy and lets you create fillets that are smooth and require little sanding. Its color is a consistent brown, so 405 Filleting Blend can be blended with other WEST SYSTEM Fillers to modify the shade of thickened epoxy. Adhesive fillers are suitable for most epoxy bonding situations especially with high-density materials like hardwoods and metals. Adhesive filler mixtures cure to a strong, hard-to-sand cured epoxy plastic useful in structural applications like general bonding, filleting and hardware bonding.